View More In Floor Lamps - Page 5. Do you ever walk into another person’s home and feel like you ordered all of the same items from the same Swedish catalog? Your personality and lifestyle are completely unique, and should be reflected in your home. The Arquer floor lamp from Versanora is the epitome of style and the pinnacle of functionality. It will provide your home with a unique, modern flair that you can’t find at those big-box stores. The graceful curve of this lamp’s stand is finished in sleek silver, and supports a bell-like lampshade that seems to dangle effortlessly in the air. The base of the stand is finished in white marble for a classic look. This modern reinvention of postmodern styles combines clean lines with classic finishes for a beautiful finished product. And the convenient floor switch provides for easy operation and simple functionality. With the Arquer floor lamp, your contemporary home will stand out above the rest. 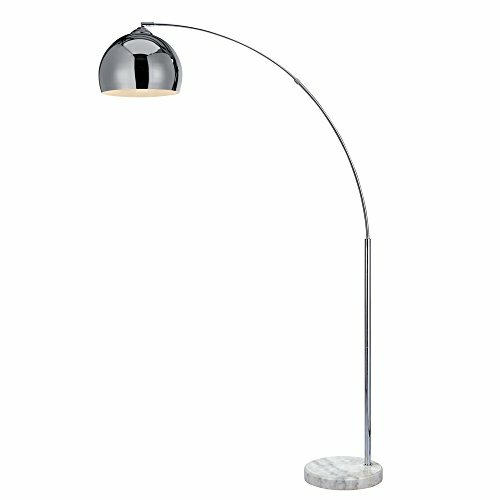 Lamp:11.81" (L) x 43.30" (W) x 66.93" (H). Shade diameter:11.81". Floor lamp with UL listed. Estimated assembly time: 20 minutes. Packaged with step-by-step assembly instruction. If you have any questions about this product by Versanora, contact us by completing and submitting the form below. If you are looking for a specif part number, please include it with your message.